As part of Little Bird Organic's nationwide September Plant-Based Challenge, the Little Bird team asked me to share a simple, easy and delicious plant-based recipe! Without much thought, I whipped up what I made last week - a bowl full of spring with fresh veges from my garden. Funnily enough, millet is most often associated as the main ingredient in bird seed - which I find hilarious as I've passed on this recipe for Little 'Bird' Organics to share! So it's good for the birds, but also for us! Millet is a seed with a good source of minerals such as copper, phosphorus, manganese and magnesium. It can be made in both sweet and savoury dishes and is an excellent replacement for rice. Dan and I used to love big couscous salads back in the day, and now we are gluten-free we can enjoy the same kind of salad but with millet instead + it's much better for you! Make sure to buy organic millet as this guarantees it hasn't been sprayed with any toxic chemicals. The hardest part about making this dish is waiting for the potatoes to cook! Happy cooking! 1. Preheat oven to 180 degrees on bake. 2. Scrub the dirt off your potatoes and place them in a flat oven dish. Pop in the whole garlic cloves and scoop of coconut oil. The oil helps to infuse the garlic into the potatoes - it's so delicious! I don't often consume coconut oil but for this dish, you can't skip this step! 3. The potatoes should take some time, but in the meantime, you can prep all the ingredients for the millet salad. I also made hummus from scratch and took a walk to my garden to collect some greens while I was waiting for the potatoes. 4. On a medium heat, cook the chopped red onion in a few tablespoons of balsamic vinegar for five minutes. 5. Then add the chopped mushrooms and cook through. Take off heat and set aside. 6. Cook the millet: put 1 cup of millet in a pan with 2 cups of water plus the veggie stock powder. Bring the millet to the boil and reduce the heat with a lid on to low for no more than 15 minutes. You don't want your millet to be dry, so better to undercook it and let it set aside than overcook it. 7. Check on the potatoes and turn each potato over in the baking dish. With a potato masher, squish each potato and sprinkle with salt, pepper and paprika. Return to the oven for 10 more minutes. 8. Mix the millet salad ingredients together in a big bowl: onion mushroom mix, diced tomatoes, avocados, walnuts and fresh garden greens. 9. 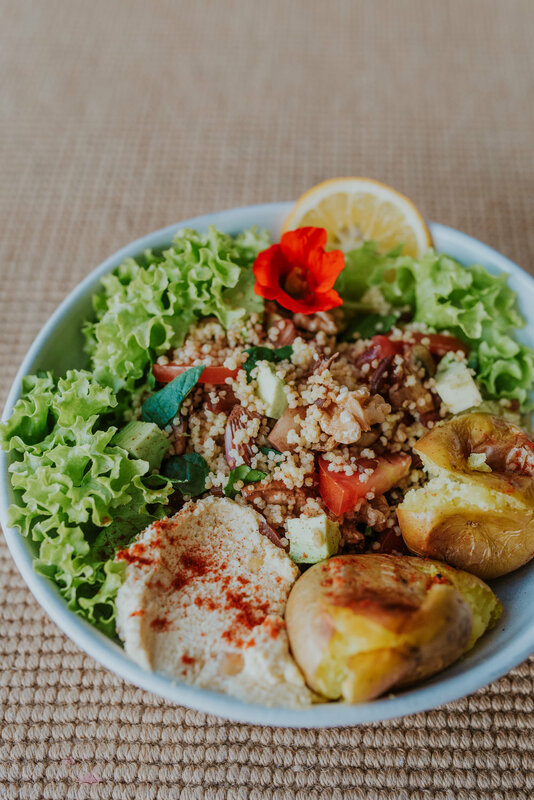 Serve garlic roasted potatoes and millet salad in a bowl with homemade hummus, a slice of lemon and some edible flowers! Should serve roughly 3 to 4 people.